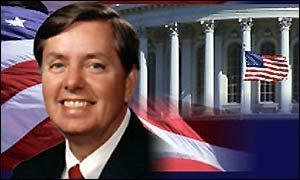 Sen. Lindsey Graham has spent most of his life in service to his community and country. First, as the city attorney for Central, SC and the asstistant attorney for Oconee County. Second, as a representative for Oconee County's second district in the South Carolina House of Representatives. Third as a Representative for South Carolina's third congressional district. He is currently South Carolina's senior senator. Graham has also served the country in the militay as a lawyer for 23 years. He spent 6 years, including a tour of duty in Europe, in the active duty Air Force.During the Gulf War he was called in to service at McEntire Air National Guard Base and a member of the South Carolina Air National Guard. Currently, he is the only U.S. senator who is a member of the Air Force Reserve. He has attained the rank of Colonel and is a judge of the Air Force Court of Criminal Appeals.